The Owl P8DS System can quickly and easily cast and run 1 or 2 gels in the same device. 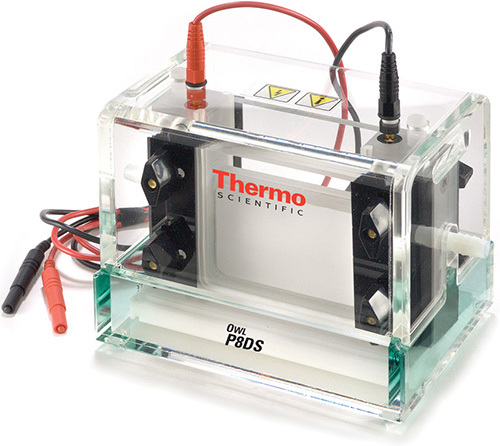 When used with the available combs, spacers, alumina and glass plates, it is the perfect tool for second dimension protocols of 2-D electrophoresis, SDS and agarose gels, and native PAGE electrophoresis. Ships complete with Upper Buffer Chamber with Internal Cooling Core, Lower Buffer Chamber, SuperSafe Lid with Attached Power Supply Leads, 4 Blank Glass Plates, 2 Notched Glass Plates, 2 Notched Alumina Plates, Spacer Set (0.8 mm Thick), Blocking Plate for Single Gel Operation, Spacer Placer, 2 Combs: 10 Well, 0.8 mm Thick. The unique agarose plug method makes casting gel simple and quick. Gel assemblies do not have to be moved once set-up. The two individual steps of casting and running in different devices are now combined. Part Number P8DS-012. Includes the Lid and Attached Power Supply Leads.